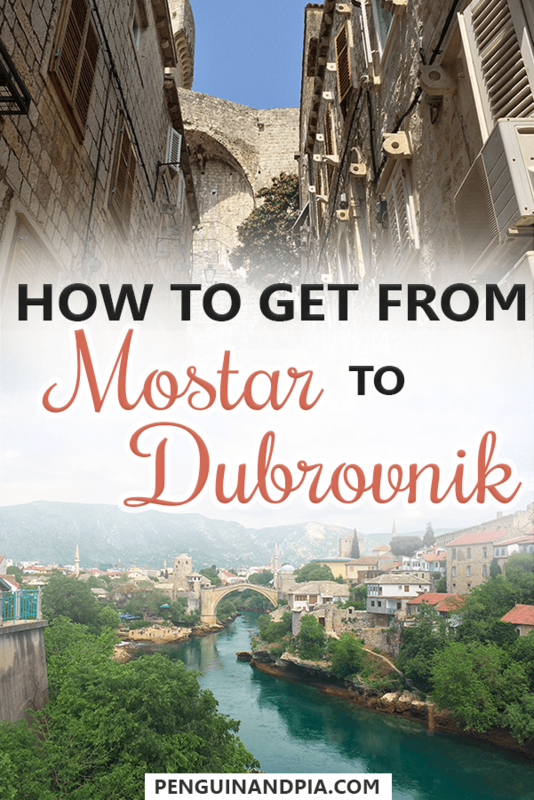 Travelling from Mostar to Dubrovnik is Pretty Simple! If you’re travelling around the Balkans, the bus is usually your go to mode of transportation. It’s no different if you’re travelling between Croatia and Bosnia & Herzegovina. We travelled from Mostar to Dubrovnik in a southbound direction. Lots of people head from Dubrovnik to Split via Mostar in a northbound direction – and that’s definitely doable as well! It’s a roundabout way of getting up the coast but you’d definitely see parts of Bosnia and that’s great. There are other ways to get between the two locations, though. Lots of travellers complete day trips or transfers from Dubrovnik to Mostar. This is a really popular route and we definitely saw lots of day tripping buses arrive into Mostar when we stayed there. If you wanted to drive from Mostar to Dubrovnik, the best route from Mostar to Dubrovnik is essentially straight down. Overall, the trip from Mostar to Dubrovnik it pretty simple, so from understanding the bus timetable to actually catching the bus, we’ll help you with the journey! Wondering what Bosnia and Herzegovina is like to visit? Read About Our Travel Experience in Bosnia. Are you travelling from Podgorica to Split? We did the journey and give you all the Need-to-Knows here! How about travelling from Split to Sarajevo? We did that, too – read more! Heading from Croatia back into Montenegro? Here’s Our Journey on the Bus from Dubrovnik to Kotor! Travelling down to Albania? Take the Bus from Ulcinj, Montenegro to Tirana, Albania! There are a couple of different ways you could travel from Mostar to Dubrovnik. We outline them below, but focus on the bus because that’s the one we had experience with! 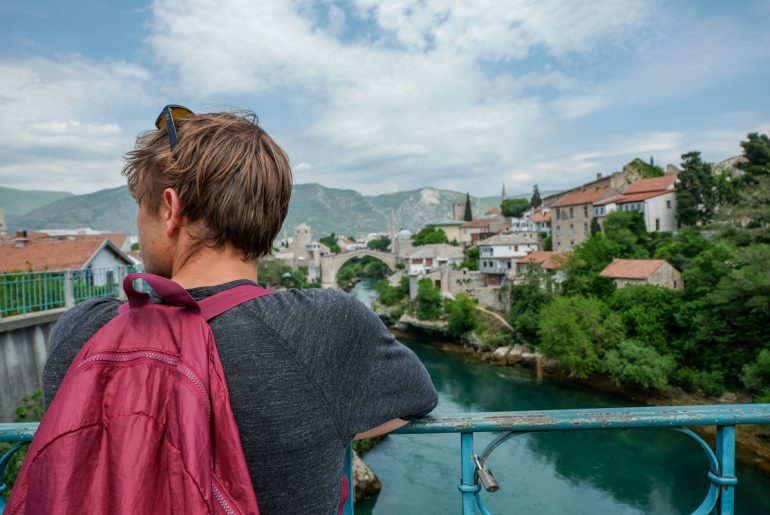 Oh, and if you’re not ready to leave Mostar yet than check out our guide in 12 things to do in Mostar. 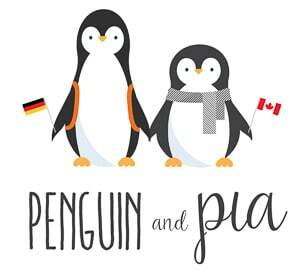 We had an amazing time visiting and think you might, too! In theory, one of the easiest ways to get from Mostar to Dubrovnik is to drive yourself. If you are on a road trip and have your own car with your, this is certainly the case since you are not restricted by any bus times and can go when you want. To drive there, you basically head straight south using the M17.3 and the M6. You’ll cross the border into Croatia and we’ll talk about our border crossing down below. If you have a rental car, however, it might not be that simple. Sometimes rental car agencies do not allow you to take the car across the border – since Bosnia & Herzegovina is not part of the EU, this could be a problem. Make sure to check with your rental agency and insurance if this is possible to avoid any complications. Otherwise, it would be better to choose a different method of transportation. Unfortunately, we have to disappoint the train lovers since there is no train connection between Mostar and Dubrovnik (or the area close to Dubrovnik). While train travel in the Balkans has always been somewhat sparse and buses are the mode of transport of choice, even more international train connections have been cancelled in the last decade. You could hire a private transfer company if you wanted a bit more flexibility than the bus schedule provides – or if you need more storage room. Travelling by bus around the Balkans is usually the best option. The buses run many times a day on a number of the major routes. Given the ease of getting from place to place, the cost isn’t usually too steep if you’re on a budget. That’s what we did travelling from Mostar to Dubrovnik so that’s what we’re going to write about! Time: The journey took approx. 3 hours. There are a few different travel times. Cost: Approximately 22.50 euro/person for tickets, “Checked” Bags – 1 Euro per bag. Tickets Bought: At the Mostar Bus Station a day in advance. >Overall, we had a great bus ride. The scenery was nice, the border crossings weren’t too bad, we had snacks, it was easy. We honestly forget the company we rode with but they are all pretty similar so you come to expect the same kinds of buses and service each time. We went the day before and bought the tickets at the station because it isn’t doable online. We had gotten into the habit of doing this because although you can easily check the schedules online with Bus Croatia on Get By Bus, mobile tickets aren’t usually accepted and we never had a printer in our Airbnbs/Apartments. Thus, we went to the station and bought a paper ticket. Simple! Like many Bosnian bus stations, there are taxis and cafes and one main ticket booth. We had a coffee waiting for the bus – the platform number is on your ticket but be sure to keep an eye out for the sign on the front of the bus. This route included two border crossings. We will explain them both in detail so you have an idea of what to expect. The first crossing seemed simple – but then it took longer than expected. We left Bosnia when the bus pulled to the side of the road near what looked like a checkpoint. Passports were collected and within a few minutes, the border guy came back with all of them. We thought it was odd that we didn’t get an exit stamp or anything else but it’s not always a thing in these countries – even in the airports. We came up to the border into Croatia. It was here that the bus stopped and everyone single person had to get off and grab their bags and passports. We were then told to file into a small room with tables where border guards checked everyone’s bags one by one. Some people had a quick check, while others had their entire bag rifled through. Lisa went first for us – and the woman was super nice. They went for the makeup bags and toiletry bags first which made us think that this might be a border used for running drugs between the countries. In any case, Lisa was fine. Then came Eric. The same women had him open a few zippered pouches, asked about a few bottles in his toiletry bag (which were in their original packaging) and off he went. In our other packing post, we actually wrote at length about the American guy who had bags of medicines and supplements – all unlabeled – and caused QUITE the stir with the guards. He basically held up the bus for everyone – which goes to show you what a little organization can do at key times in your travels. Once everyone was back on the bus, we continued with our drive – and we were back in Croatia. We’ve touched upon this in our Podgorica to Split travel post but we’ll cover it again here. If you’re driving the coast of Croatia between Dubrovnik and Split, there is a piece of Bosnia & Herzegovina that sticks out to the coastline along the highway. You will cross through it, and you will temporarily enter Bosnia for about 10 to 15 minutes. This crossing was pretty simple for us but again, we travelled in the off-season. The border guard came on the bus, collected the passports/ID cards, and went to the booth. After about 5 minutes, he came back on, handed them back out, and we were “in” Bosnia. The same thing happened “leaving” Bosnia. Pretty simple. Depending on the driver, the company, and time of day, you might make a stop in Bosnia for a break. Our driver stopped at a hotel with a grocery store and cafe in the bottom level. Some people sat for a quick coffee, other had a smoke, and we grabbed food because we wanted a snack! As the bus ride ended, we arrived in Dubrovnik – a place we had already been before. It was kind of weird – we were back to a place we’d stopped in before but after months of travelling we were completely different people. Travel changes you – and the last few countries certainly opened our eyes to the beauty of the Balkans. And there you have it – our journey from Mostar to Dubrovnik. All in all, it was one of the more simple transitions we had around the Balkans. Once you get an idea of where your bags should go, what to expect at these stations, and if you remember snacks and water, you should have smooth sailing! What do you think? Did you do this transition in the busy season? Was it as much of a nightmare as people have made it out to be? Get in touch and let us know – we’d love to hear from you.